Connectors, Crimping Tools, cable assemblies and more. Connecting quality. SZ Elektronik is the distributor and cable assembly manufacturer for the most different types of connectors, crimping tools and ready-to-use cable assemblies. We supply many circular connectors, rectangular connectors, backshells, contacts and crimping pliers especially by Amphenol, DMC, FCI, ITT Cannon, Harting, Harwin, Molex, Souriau, TE Connectivity and Veam from stock or assemble them to high-quality cable assemblies and wire harnesses. With our unique MIL connector express service, we specialize on quick delivery of many MIL, VG, MS, PAN, ABS, ASNE and ESC standardized connectors, backshells, crimping tools, shrinking mouldings, heat shrink tubing, and cables. Often from local stock Dusseldorf or within a few days. Our special strength being the quick deliveries of military and avionic connecting components from Amphenol, DMC, ITT Cannon, Souriau und TE Connectivity. We are one completely to few suppliers, who many MIL-, VG-, MS-, PAN-, ABS-, ASNE- and ESC-connectors, Backshells, crimping tools, moulded parts, shrinking tubes and cable delivers from stock and also can produce out of this highly special cable assemblies. 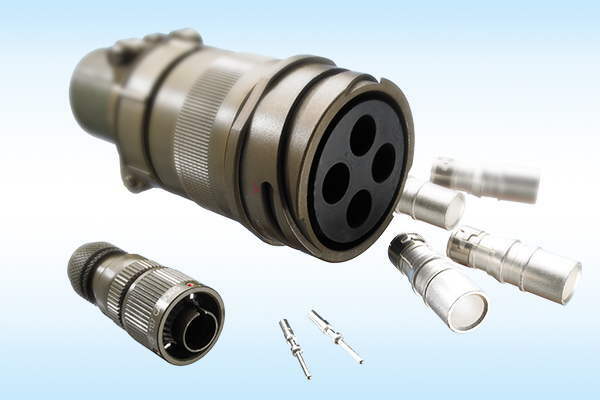 We are the expert for MIL / Aero connectors und Backshells from the Military-Norms MIL-C-24308, MIL-C-26482 I, MIL-C-26482 II, MIL-C-38999 I, MIL-C-38999 II, MIL-C-38999 III, MIL-C-38999 IV, MIL-C-5015, MIL-C-83723 III, MIL-C-85049, the MS-Norms MS27466, MS27467, MS27468, MS27472, MS27473, MS27474, MS27484 , MS27497, MS27499, MS27505, MS27508, MS27656, MS3100, MS3101, MS3102, MS3106, MS3108, MS3110, MS3111, MS3112, MS3114, MS3116, MS3120, MS3121, MS3122, MS3124, MS3126, MS3450, MS3451, MS3456, MS3459, MS3470 , MS3471, MS3472, MS3474, MS3475, MS3476, the VG-Norms VG95234, VG95328, VG96912 und VG96918. 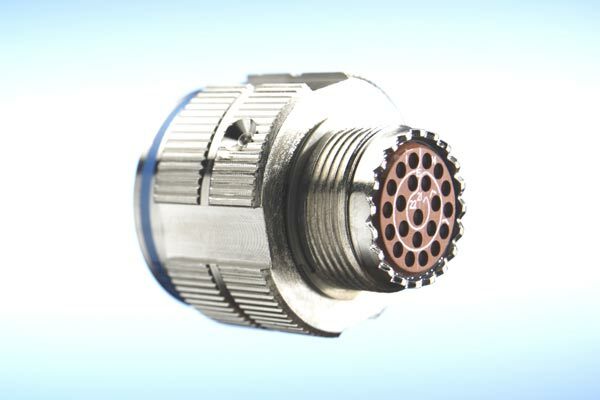 We deliver from stock or very at short notice the Amphenol-connectors JT, LJT, PT, TV / CTV, the ITT Cannon-connectors KPT, KPSE and the Souriau-connectors 847, 848, 851, 8525, 8LT, 8D, 8ST und 8T. Of course the fitting ones also belong to our assortment the Handcrimping Pliers M22520/1-01, M22520/2-01, M22520/5-01, M22520 /7-01 und M22520/10-01 we deliver for attractive prices from stock Dusseldorf. We are the specialist for aero connectors, composite connectors, filter connectors, hermetic connectors, MIL connectors, rectangular connectors, circular connectors, wire-to-board, wire-to-wire connectors and many other connectors. Renowned national and international customers in the fields of aviation and aerospace, military, railway, marine, industrial electronics and trade build on our fast deliveries and the quality products of Amphenol, Burndy, DMC, Harting, Harwin, Intercontec, ITT Cannon, Molex, Souriau, TE Connectivity, Veam, and other market leaders. We are the specialist for almost all manual crimping pliers, pneumatic crimping pliers, positioners, insertion and extraction tools for the professional processing of military, aviation-standardized and manufacturer-specific crimp contacts. We supply MIL crimping tools and other crimping tools of the leading connector manufacturers, from stock or very quickly. We are the competent cable harness manufacturer and manufacturing service provider for high-quality customized cable assemblies, industrial and military wiring, electronic components, hardware, housing assembly, for more than 20 years. During this time, we produced numerous industrial and military connectors, backshells, crimp contacts, crimping pliers, solder contacts, cables, heat shrink tubing, shrink form parts of manufacturers AMP, Apem, Amphenol, Berg, Binder, Burndy, Commital, Contact, Coninvers, 3M, DMC, FCI, Fischer Connectors, Harting, Hirose, Hirschmann, Hypertac, Intercontec, ITT Cannon, JST, Lemosa, Molex, Odu, Preh, Raychem, Samtec, Schaltbau, Souriau, TE Connectivity, Tyco and Veam. Our cable assemblies are used in the areas of railway, aviation, military, marine, general engineering, measurement and control technology. Did you know, that we assemble thousands of signal connectors of Intercontec every year? We crimp and solder the contacts for 6, 7, 8 + 1, 9, 12, 16, 19 and 26 pin signal connectors, signal flange sockets and signal couplings. Always fast, always 100% tested! SZ Elektronik, your rapid cable harness manufacturer from Düsseldorf. M22520/1-01, M22520/2-01, M22520/5-01, M22520/7-01, M22520/7-01, M22520/10-01, M300BT and more. 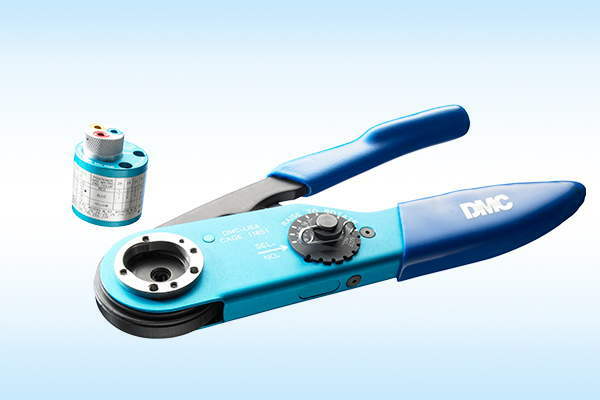 We have many DMC crimp pliers on stock or in the equipment for own cable assemblies. Test nevertheless the quality our manufactured MIL-cable assemblies! With the new WME connector Souriau presents the first EN16330 approved connector for superstructureson vehicles and machines. This European standard aims at ensuring the compatibility of connectors and the secure interchangeability onsuperstructures inside or outside of vehicles and machinery. These include cleaning vehicles, mining equipment, snow plows and agricultural machinery. 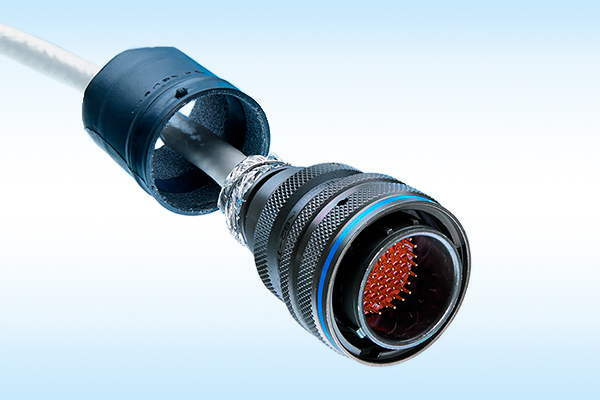 WME connectors are UV resistant, robust, waterproof and resistant to acids, oil and gases. The WME connectors series include connectors, mounting flanges, protective caps and accessories. 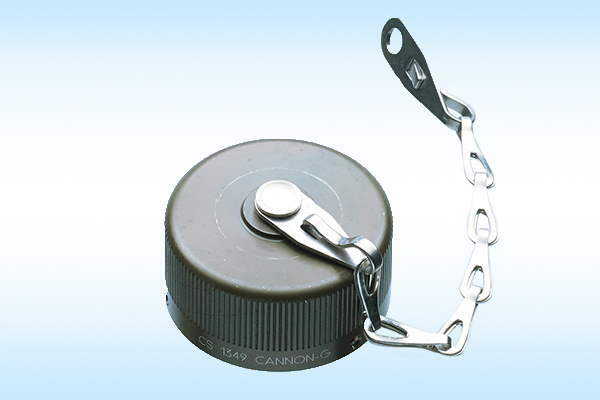 A self-closing cover with an additional locking mechanism protects due to vibration. WME connectors are easy to grip and can be connected also with gloves. A distinction is made between WME1 and WME2 connectors. 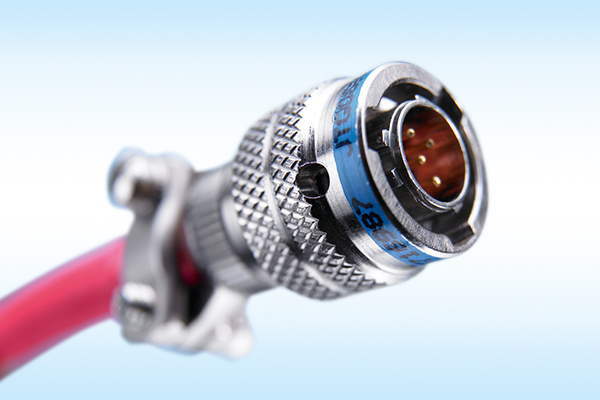 WME1 connectors are IP68/69 K waterproof, suitable for temperature ranges from -30°C to 85°C and are preferably used in the vehicle exterior. WME2 connectors areclassified according to standard UL94,class V-O,regarding to flame retardanceand fire safety, and are mostly used in the interior of vehicles.